“Suzanne Karpelès: Thinking Through The Width and Thickness of Time” explores questions of temporality using letters written between 1930 and 1935 by Suzanne Karpelès (1890-1968), director of the Royal Library at Phomn Penh (1925-41), chief publications officer for the École Supérieure de Pāli (1925-41) and director of the Institute of Buddhist Studies (1930-41) (which became a centre for resistance to French colonialism). The article begins by introducing Karpelès and by discussing scholarship on temporalities as it relates to the French Protectorate of Indochina. The middle section uses vignettes from Karpelès’ letters and writing to explore multiple temporalities and their entanglements and how these might play into the politics of power and of desire as they thread together in configurations of gender, education, imperialism and religion. I deploy Nóvoa and Yariv-Mashal’s (2003) argument about the need to consider the “width and thickness” of time when discussing colonial regimes. I also discuss temporal entanglements that have been variously cast through metaphors of geological strata (Nóvoa and Yariv-Mashal 2003), temporal co-existence and collision (Harootunian 2007), zigzagging (Zerubavel 2000) and as practices of synchronisation (Jordheim 2013). The conclusion touches on some of the challenges facing scholars interested in multiple temporalities and temporal entanglements that Lorenz and Beverage (2013) hightlight. Reference: Goodman, Joyce. “Suzanne Karpelès (1890-1969): Thinking with the Width and Thickness of Time. 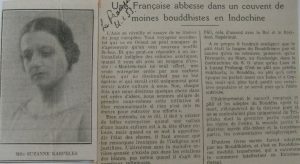 Suzanne Karpelès (1890-1969) Denken Mit Der Breite Und Tiefe Der Zeit.” IJHE Bildungsgeschichte/International Journal for the Historiography of Education, 8, no. 2 (2018): 231-44.